On May 11, 2017, six students in the Department of Fire Protection at the University of Maryland presented their ideas for a fire protection industry product to a panel of judges at Jensen Hughes. Located in Baltimore, Jensen Hughes is “one of the largest fire protection and life safety engineering and consulting firms” in the world. For the second year in a row, they hosted students enrolled in ENFP 429, an independent study option, also known as the ‘Think Tank’ course. 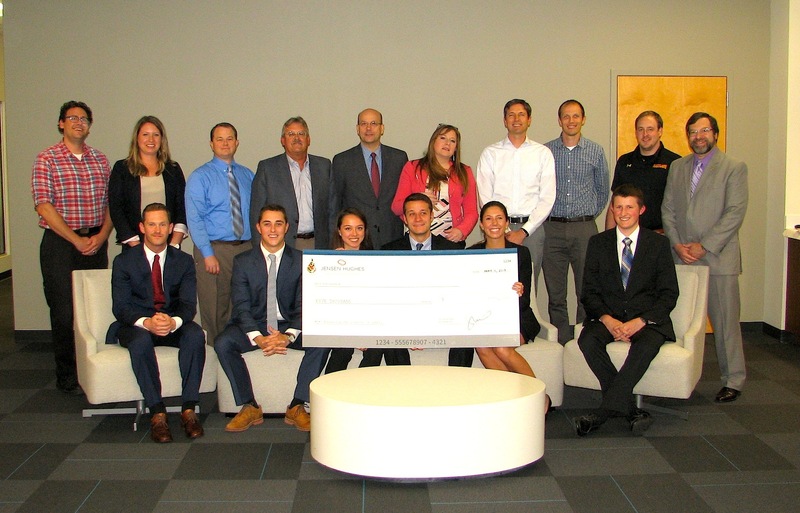 The students - Rachel Bourassa (Junior, FPE), Andrew Klein (Junior, FPE), Grant Millenburg (Senior, FPE), Porscha Silva (Junior, FPE), Connor Van Scyoc (Junior, FPE), and Nicholas Zielinski (Junior, FPE) – competed for a Richard G. Gewain Scholarship, which comes with a $5k cash prize in addition the possibility of Jensen Hughes developing the winner's product. Richard Gewain was a fire protection engineer for the American Iron and Steel Institute who went to work for Hughes Associates (now Jensen Hughes) in 1987. An expert in writing building fire codes, Gewain had an innate ability to transfer scientific and test data into practical engineering guidelines and solutions, making him a leader in the field of fire protection. To honor Gewain’s achievements, Jensen Hughes offers an academic performance based scholarship to FPE undergraduate students on an annual basis. Last year, they approached Jim Milke, FPE Professor and Chair, about the possibility of a ‘Think Tank’ course, similar to ABC’s Shark Tank television show, and selected Clinical Professor Ken Isman to teach it. Indeed, the point of the course is to not only come up with an innovative way to save lives and property, but to show that there is profit to be made, enticing companies to invest. Rachel Bourassa took first place for her FireBot project: an autonomous mobile fire detection and communication device that could be used to replace humans for a fire watch. Currently, when a fire protection system is out of service, people need to patrol a building to look for fires and report them quickly if discovered, which can be extremely expensive, especially in the nuclear power industry where access to critical areas is not a simple task. After completing a few internships in the nuclear power industry, Bourassa decided there must be a more efficient way to provide a fire watch and detect fires, in addition to finding a better use of people’s time. Grant Millenburg won first runner up, which came with a $2k prize for his project, a mobile phone application called EZgress whose goal is to improve the speed at which occupants of assembly occupancies like movie theatres or dance clubs, receive emergency notification and efficient venue-exiting information. Porscha Silva took second runner up, which came with a $1k prize for her CAE project: Code Access Efficiency is intended to familiarize users with the Life Safety Code (LSC) and International Building Code (IBC) via a digital platform. CAE will offer an online database, which users can access to locate the specific section of the LSC or IBC their projects require. The idea of CAE is to make reviewing diagrams, reports, etc. by engineers and architects more efficient, saving time and money. In addition to the awards, Jensen Hughes provided a mentor for each student. The mentor/student duo met multiple times during the semester to review project development, and discuss methods of improvement in each case. Jensen Hughes also provided two staff members to help coordinate the class: Jason Sutula (JH Guest Lecturer) provided guest lecturing, while Christine Sauer (Senior Fire Protection Engineer) ensured all class details were managed including organizing tours of the Jensen Hughes offices, and arranging the final pitch session to the panel. The student mentors were Josh Dinaburg (for Rachel B. ), Scott Golly (for Andrew Klein), Chris Moran (for Grant Millenburg), Tony Jondo (for Porscha Silva), Eleni Rotjas (for Connor Van Scyoc), and Mike Love (for Nicholas Zielinski). The judging panel consisted of Paul Orzeske (JH CEO), Joe Scheffey (JH Senior Vice President), Heather Stickler (JH Vice President of Marketing), and Ken Isman. Professor Isman plans to offer the course again during the Spring 2018 semester and will cap enrollment at 10 students.